Stuffed Green Pepper Soup is a quick and delicious meal perfect for fall and winter. 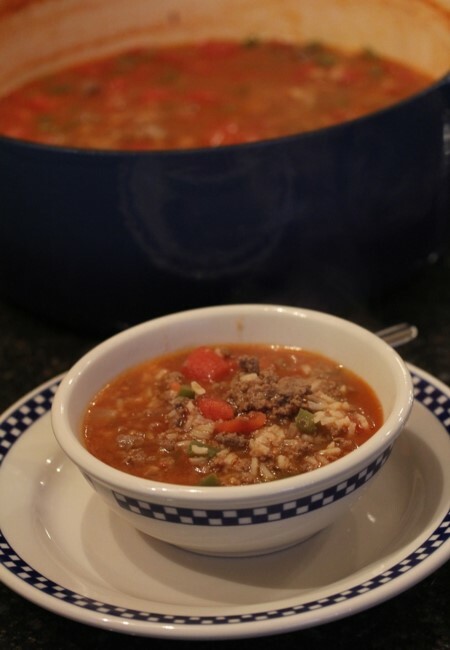 Soup for dinner is usually a weekly occurrence at our house during the fall and winter. It is a great meal because it is usually a meal all by itself. Yes, you can add bread or salad, but you don’t have to. I also like to make soup because it is usually a quick and easy meal or a crock pot friendly meal. Both of which I love for busy days. Our peppers plants in the garden were still going strong at the end of October. I love peppers and have been freezing them like crazy over the last few months. A freezer full of peppers is definitely a good thing! Several in my family love stuffed peppers, but I don’t make them very often, because it takes quite a few peppers to serve my whole family. Stuffed green pepper soup though is a great way to get the flavors of stuffed peppers while only using a couple of peppers. It is also a lot less work than stuffed peppers. 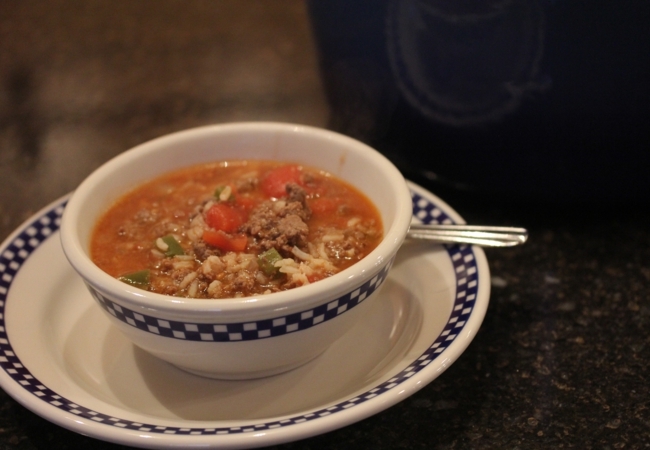 I have seen quite a few recipes for stuffed pepper soup, but mine is a little different. Most recipes that I have seen call for cooked rice as an ingredient. I love to find different ways to use cooked rice, because it works great for leftover rice. However for stuffed pepper soup I prefer to cook the rice in the soup rather than added it already cooked. This allows the rice to pick up the flavor of the soup while it is cooking and gives you a much more flavorful result. If you have some leftover rice, or don’t want to cook the rice in the soup, feel free to decrease the liquid slightly and add cooked rice instead of uncooked rice. But I think you will like it if you give cooking the rice in the soup a try. In a large pot cook meat, onions, and peppers until meat is done and onions and peppers are tender. Drain off any fat. Bring to a boil. Reduce heat to low and cook for 25-30 minutes or until rice is tender. Stir occasionally while cooking. 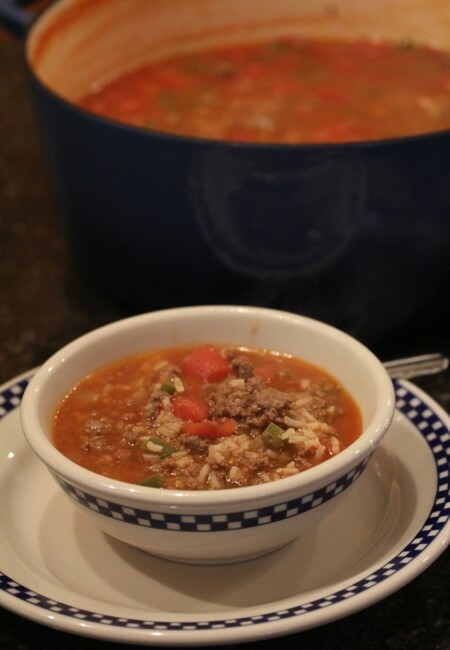 This soup is great leftover, but it does thicken up as the rice absorbs the liquid. If you don’t have fresh green peppers you can add a couple of cups of frozen green peppers or a green pepper onion mix. I thought this looked good when I first saw it and am so glad I tried it! I made a few changes, based on my family’s tastes: I added three cloves of garlic, didn’t drain the fat, and doubled the spices. These were good choices for us. We found it needed more salt, but we’re sodium crazy here. On the advice of my sister, I doubled the rice. That wasn’t a good choice. It went from soup to a rice stew. It’s not bad, at all, but when you’re expecting soup it’s a bit disconcerting. Overall, it’s something we’re going to do again. I absolutely LOVE that I can give leftovers in my sister’s lunch, which isn’t always the easiest thing to do. So, thank you! This was delicious (I was eating as I typed), easy (six things to wash! Six! ), and the family loved it. I’m definitely going to be making more of your recipes after this. I am so glad that you enjoyed it. And thanks so much for letting me know. I will have to try more garlic next time. I bet it adds a lot of extra flavor to it. Hi Lynn. This looks great and I can’t wait to make it. Have you ever made it with brown rice instead of white rice, and if so, does the cooking time need to be adjusted? I assume you are using long grain rice and not instant rice, correct? I don’t use a lot of brown rice because my husband doesn’t like it. I think you could easily use it in this recipe though. I do use regular long grain rice, so I think regular brown rice would work fine. I think you would need to increase the liquid and the cooking time. I am guessing you would need to double the cooking time. I don’t remember how much more water brown rice needs, but I think it would need to be about 1 cup more. I hope that helps.